Wooster Collective posted this Familia Gangsters video yesterday. It features the work of graffiti artist Mundano who uses the wagons of cartadores (pickers of recyclable materials) as canvases for his political murals. For a closer look at this ongoing series, check out this flickr album. And if you haven’t yet, please immediately buy, rent or stream the documentary Waste Land. It chronicles another trash-themed Brazilian art project in which photographer Vik Muniz enlisted cartadores to help create massive portraits of themselves using recyclables picked from a gigantic dump, then sold prints to profit their workers’ collective. A minimalist post for a minimalist concept: click here for details then follow #Less365 on Twitter. I’m in Minneapolis for the weekend visiting my mom. The weather is perfect and we’ve been biking a lot. 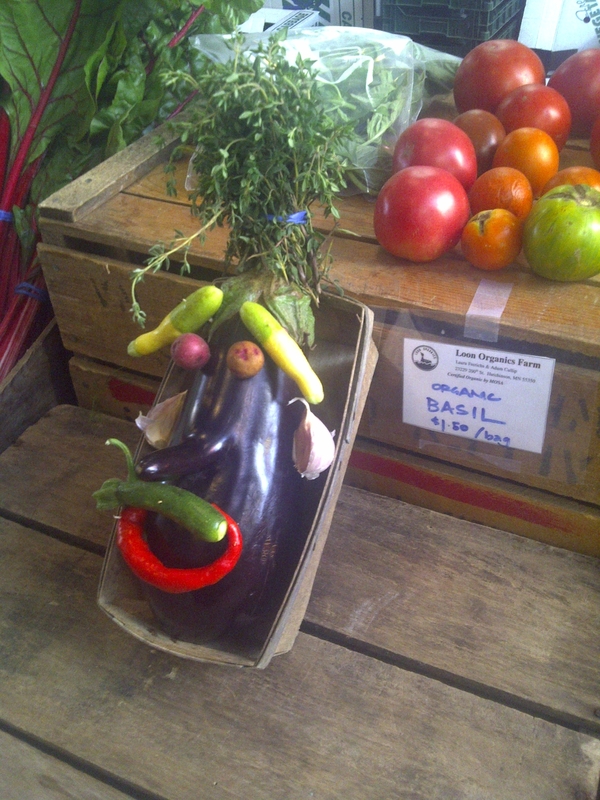 We usually go to the big farmer’s market, which is one of my favorite open air markets in the whole world. This time, though, we popped just over the river from my mom’s place to the Mill City Farmer’s Market tucked adorably between the Mill City Museum and the new Guthrie Theater. Minneapolis recently licensed food trucks, so like many other places across the country, street food is all the rage here. We ate some yummy tacos before browsing the Hmong vegetable stalls, Nepali momo stand, Iranian gourmet chocolate table, the cute sundress shop and all kinds of other delectable vendor offerings. There was some live music playing and people were out in droves, sitting on the Guthrie steps to eat and listen and milling about the market. When my mom and I were done with our tacos (and, later, some ginger sorbet) we tossed our disposable packaging and utensils into one of the large compost bins prominently on display and STAFFED by local volunteers to help you decide what went into which bin. 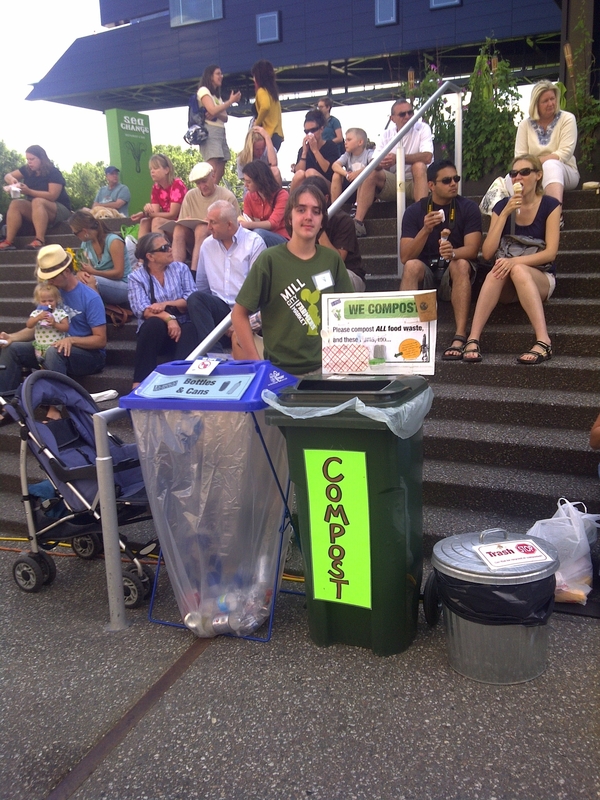 I couldn’t get over the staffed composting bins. Ours gave us a helpful lecture on why he felt composting was way better than recycling, stopping between impassioned sentences to direct the disposal of plates and cups. I love seeing the can labeled “trash” dwarfed in size compared to the other receptacles. Last night I went to the opening party for The Palms, a pop up urban beach club featuring dumpster pools in Long Island City. The art, music and concept are a collaboration between the NYC groups behind many of the city’s most interesting semi-secret and heavily themed events. Despite the recent disillusioning discovery that dumpster pools are all made from newly constructed containers that have never held trash, I was psyched to check out the scene. I mean, just look at the teaser video, wouldn’t you be? While it was cool to see the pools up close, they were built tastefully into a deck off to the side and overall, as an evening event, the party fell a bit flat for me. Paris Metro gawking rules applied, but I didn’t see too much worth staring at. One or two bold ladies danced in bikinis. Hipsters played what my friend Oriana of Brooklyn Spaces called “a vicious game of chicken” in the water. An obligatory gourmet food truck sold fancy fast food. The limited bar list included PBR and soju cocktails. House music pulsed, a lone breaker busted some moves. Maybe we got there too early. I just never forgot I was standing in a mostly empty parking lot in Queens. I think I would have been more excited if the pools were in the center of the space and distributed in a way that forced me to walk around them. Anyway, in this final weeks of summer, I definitely see the appeal of just such a chic destination down the street from PS1. From what I understand the organizers plan to host semi regular daytime events until Labor Day. Local trashies, let me know if any of you go check out the joint for yourselves. My favorite thing about this installation art project up now in Paris and beautifully documented over at inhabitat is the adorable typo in this video. Streaming TED talks is a dangerous habit. It’s so hard to watch just one. This morning, via the TED Blog, I discovered this great presentation by Ellen Gustafson, founder of something called The 30 Project that looks at how food systems have changed since 1980 and tries to undo some of the damage. Maybe because it’s Ramadan—a time of year when many of us across the planet are extra attuned to issues of hunger and poverty—I found her talk to be extremely compelling. In particular, she makes great links between the underlying causes of hunger and obesity and pokes holes in oversimplified responses that aim to feed the hungry. Anyway, with the exception of critiquing canned food and canned food drives, Gustafson doesn’t get much into issues of waste and recycling. So, of course, I had to go rooting through TED vaults where I came across this talk by legendary Ray “the green CEO” Anderson. I am always skeptical of businessmen hawking good causes. And Anderson, like any other CEO has an incentive to promote his company’s public image. But I am consistently absorbed when I see clips of this guy and his near-religious passion for treading lightly. I’ll admit, I zoned out a bit when he got too into his own math equations, but tuned right back in when he defined affluence as a means to an end, rather than the goal in and of itself. Simple, but critical framing. We don’t amass stuff just to have stuff, we do it because we think it will make us happy. See what you think. The sometimes kooky and always entertaining philospoher Slavoj Žižek offered these thoughts on humans and our evolving relationship with trash and nature for the documentary Examined Life. If you haven’t seen it, The Pervert’s Guide to Cinema is an excellent rental choice. Thanks for the tip, Tony Do!